When I went to school in Santa Cruz, Star Bene was one of the fancier restaurants I heard about but never had the chance to go to because (a) it was outside the range of my college student budget and (b) none of my dates chose it for dinner. 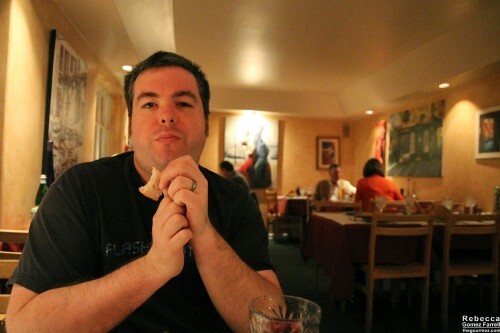 Thus, it remained an out-of-reach of restaurant that people went to on dates in my mind’s eye for the last decade. 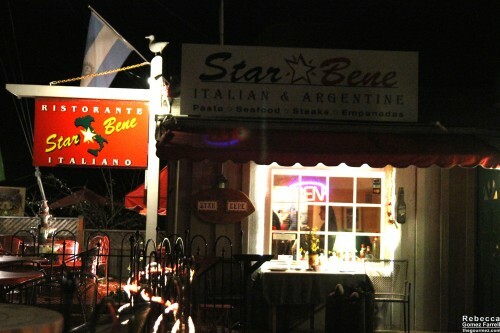 So when my husband and I stayed overnight at the lovely Bella Notte on East Cliff Drive last month, I was delighted to realize Star Bene was right down the street. My chance to live out a college fantasy was in reach. The atmosphere of Star Bene lived up to that fantasy pretty well. Yes, that’s the husband in the side dining room. It’s standard for an Italian restaurant with moderately dim and warm mood lighting, welcoming staff, dusty bottles of wine on the table, a patio area closed for the season, and an enclosed courtyard out back that looked quite swanky and I wish we’d been sat in—we didn’t notice it until later in the meal. The cuisine is a typical menu of Italian food with some Spanish influence and a specials menu of Argentinian fare. I’m not sure the specials menu actually changes, but it was a separate sheet regardless. They offer a wine and beer list as well—I should note that we didn’t particularly enjoy the chianti we ordered, but I can’t remember its name. Sorry! Bad food blogger. 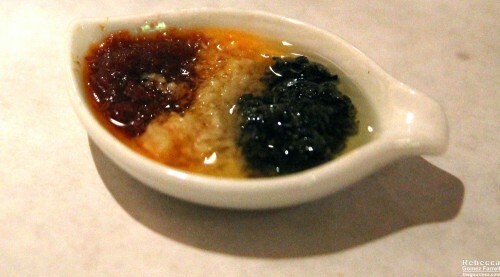 The bread service was notable for the dipping ingredients arranged by color to mimic the Italian flag. I’d actually recommend not mixing them up; the tomato, parmesan, and herb flavors were best appreciated separately when dipping. The bread itself was unremarkable Italian baguette rounds. 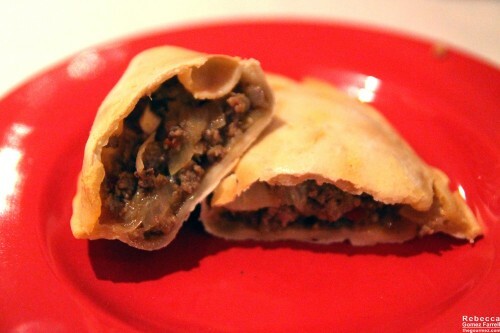 We decided to order from both the Argentinian and Italian menus, starting off with a beef empanada. It’s made with ground top sirloin, cumin, bell peppers, caramelized onions, green olives, and hard-boiled egg and it was delicious—the star of our meal. Empanada pockets vary greatly, and this one had a hard outer shell with a satisfying crunch while maintaining a nice and moist inner layer. The filling was very flavorful, enough to make me wish I’d stuck with the Argentinian menu for the main course as well. 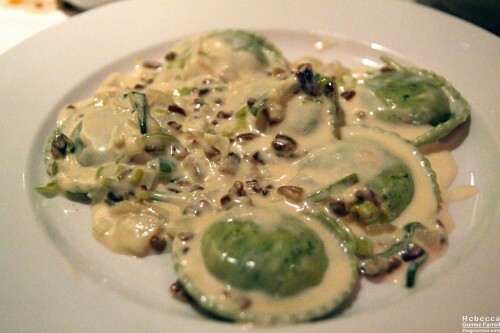 That’s my ravioli giardino, which is ravioli filled with vegetables and ricotta and topped with a leek and pecan cream sauce. It was a good dish, especially when the pecans made it onto my fork, but I did wish the leeks had flavored the sauce more. The pasta was cooked well. My husband’s risotto di paella was not up to par. 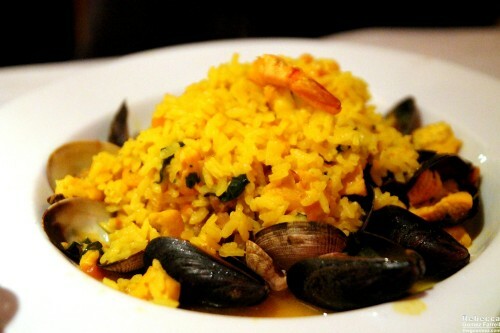 Arborio rice sautéed with mixed seafood, sausage, and chicken in a white wine and saffron reduction is its description. It indeed contained all those things, but calling something paella sets up expectations of bright flavors and tender, most meats. All the meat elements were dry as was the bland rice itself. I’d stick with the pasta—or better yet, the Argentinian specials—if I were you. Star Bene is an average Italian restaurant, though the empanada was memorable enough to make me think it’s an above average Argentinian one. Unfortunately, it also had my years of expectations from college fantasies to contend with, and thus I was satisfied but not overly impressed.